In 2009 JJ started making zines out of found objects – mostly scrap pieces of paper and pictures out of old books. 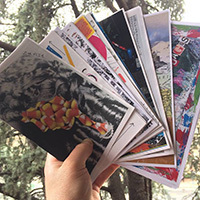 Over the next year friends and strangers started giving submissions to help create longer zines with better content. As word spread JJ started leaving issues at coffee shops, shows, libraries, art supply stores, museums, and doorsteps of unique looking places hoping that whoever picked it up would utilize the self-addressed stamped envelope and send along pieces of who they were. My goal is to have a slow progression of community through these zines by cutting and pasting together fragments from stranger’s lives to create a cohesive work of full page, color collage art. Why? Because putting pieces of ourselves together makes us whole.